Pure Rock Slim’s design is compatible with all current Intel® and AMD™ sockets and fits particularly well in PC cases with limited space thanks to the asymmetrical and compact construction. If you are seeking the best possible mix of performance and price in the Essential CPU cooler segment, your search is over. Pure Rock Slim simply has to be your choice. • High cooling capacity for this category, at 120W TDP. • Three 6mm heat pipes with aluminum caps carry heat to cooling fins for high performance. • Compact design saves space, making cooler compatible with a vast array of equipment and possible installation configurations. • Full configuration of RAM memory banks in PC cases with limited space. • Compatibility with Intel® and AMD™ sockets. • Seven blade silence-optimized 92mm be quiet! PWM fan with high-quality sleeve bearing is optimized for quietness and supports the best balance of cooling performance and silent operation. • Fan blades are airflow-optimized to reduce noise-generating turbulence. • Even at 100% PWM function, noise is a scant 25.4dB(A). • Aluminum finish on top cover and aluminum heat pipe caps. • Quick support is available via our international hotline, Mondays to Fridays from 9:00am to 5:30pm CET: +49 (0) 40-736 76 86 - 98 Features • High 120W TDP cooling efficiency. • Three high-performance 6mm heat pipes with aluminum caps. • A silence-optimized, seven blade 92mm PWM be quiet! fan. • PWM variable speed operation to help balance cooling and quietness. • Compact design for easier and more convenient installation. • Compatibility with Intel® and AMDTM sockets. be quiet! 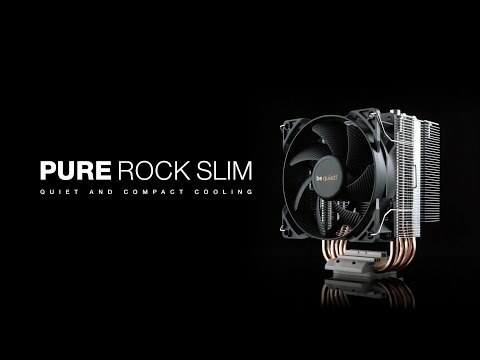 Pure Rock Slim Single Tower CPU Cooler, 3x6mm Copper Heatpipes, 1x92mm Silence-Optimised Fan, PWM, Aluminium is rated 4.9 out of 5 by 8. Rated 5 out of 5 by rome from fab value This is smaller than many of Be Quiet other coolers but it works great. The bottom is flat unlike some of Cooler Master's heat pipe coolers. There are YouTube videos showing how they're installed. On YouTube is a 3-part video “The production of be quiet! CPU coolers” showing how they're made. You won't believe how much work goes into making them. They are like jet engines and much money is involved with their construction. Inside the pipes is copper powder and a tiny amount of water which flows up and down, up and down. The pipes have to do an extremely demanding task as efficiently as possible. You really are getting some high precision engineering. That's why the makers have to test them without any fans running. Rated 4 out of 5 by Relics from Cool & Cheap For a relatively simple design this cooler is rather efficient. For the past 24 hours I've been running 3 cores on an i5 haswell at 100% load. Monitoring with Core Temp 1.7 the cpu hasn't yet got past 65 degrees. Im unaware of the ambient temperature but its easily above "room temperature" the only issue I had with this cooler is the pretty cheap feeling mounting system, it's the same kind as the stock cooler for intel it does the job ok but isn't the easiest to install. Rated 5 out of 5 by MrLinford from Great upgrade! I got this to replace the standard cool that comes with Intel CPUs. Having monitored my temps before installing I can easily say this outperformed my expectations. My CPU runs 10 degrees cooler with this installed while under a high load! Rated 5 out of 5 by EdgeOfPain from Absolutely silent, as expected I've come to expect absolute silence from brands such as Be Quiet, Noctua, and Phanteks. This cooler delivers. I was originally a bit skeptical of how quiet this cooler would be, due to the fan being 92mm instead of 120mm or 140mm, but upon trying it, I've not heard it make any noise. As for temperature, it took one of my Sandy Bridge chips, an i5-2500, from 71C max on the stock cooler to 58C max. This gives you significant overclocking headroom should you so desire it. The mounting solution for this cooler is not quite as good as the mounting solution as Noctua and Phanteks coolers. Unfortunately, for Intel boards, it uses the push-pin system, although the push pins are of a much higher quality than those on a stock Intel cooler. For AMD boards, it uses a metal bar which clamps onto the AMD CPU retention bracket. These are both fine, but an inexperienced user make fear breaking the push-pins (or outright break them) as I used to fear. There is some pre-applied thermal paste on the bottom, so make sure to clean off the existing thermal paste on your CPU to avoid making a mess around the socket. This is a fantastic cooler overall, and much more cost effective than the bulkier offerings from Be Quiet, Noctua, and Phanteks. Rated 5 out of 5 by ryan2374 from Excellent product Brought this for a build i was doing for a friend, it was a budget build and i do not like stock coolers but since it was only cooling an I5 4460 it didnt need to be anything fancy. Even after an hour of CPU stress testing full 100% load on all cores i only saw a max temp of low 50's with no noticeable noise from the cooler..... for £20 this is an excellent cooler. Would this fit in a Corsair spec-01 case? Yes it will, there are max heights for coolers in the products specs. Does this cooler comes with AM4 bracket? Or do I have to contact Be Quiet about it myself? Can you please recommend which mounting bracket to use with this. Thanks. I've recently bought this and stupidly forgot to buy a mounting bracket for it. Will this fit into the Corsair Carbide SPEC-03 case with an I5 9600K?